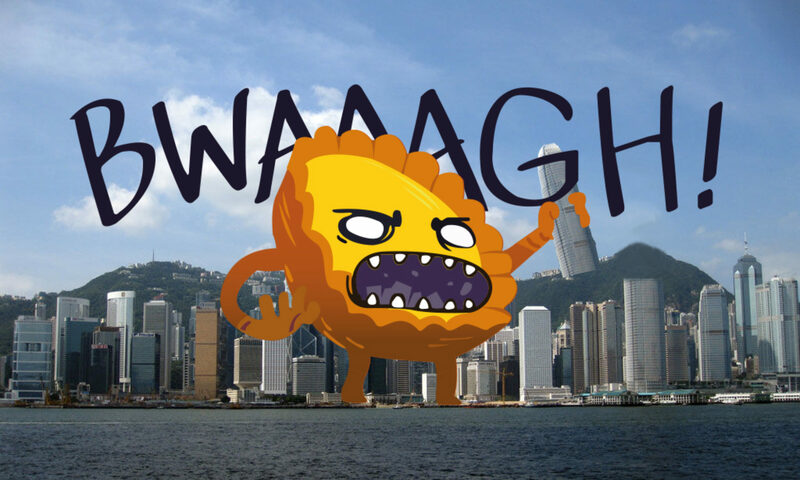 This is the first in a series of articles in which we explore the cryptozoology of Hong Kong. Each month we’ll be taking a close look at one of the city’s many imaginary creatures. Naturally, the first addition to our mythical menagerie will be dragons. In the distance Bing saw eight peaks over the peninsula. Far from home, the alien landscape set the seven year old’s imagination racing – in his eyes the eight peaks took the form of eight enormous dragons and he, the emperor of Song, was the ninth. 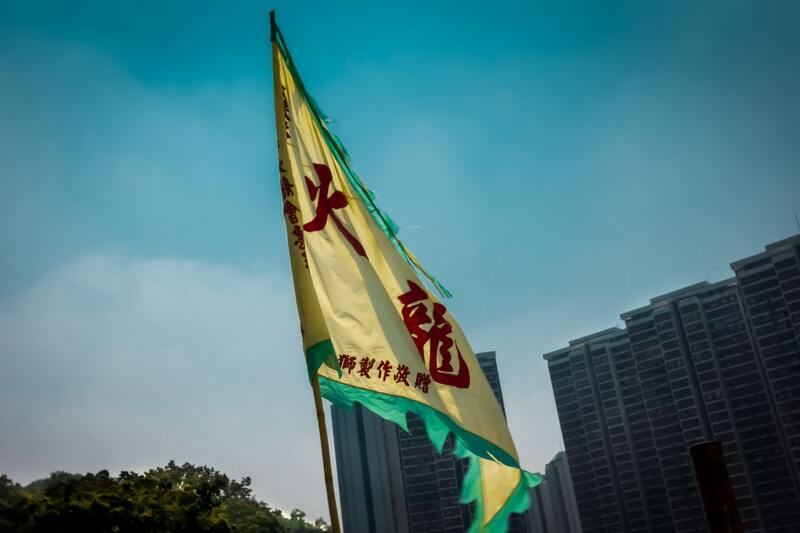 Henceforth, he decreed, the peninsula would be known as 九龍 – the nine dragons, or Kowloon. Before long the child’s world would come to an end. His armies would mount a valiant defense at the battle of Yamen before being crushed by the looming Mongol hordes. With all lost, a loyal courtier clutched the young dragon tightly in his arms and jumped from a sea cliff, ending both their lives and a dynasty. The Emperor Zhao Bing wasn’t Hong Kong’s first dragon, nor would he be its last. In the island metropolis dragons are everywhere, weaving through the gleaming steel and glass of the city, frozen in wooden tracery, standing inert in the form of countless statues, lending their name to streets, buildings, food, and even people – the city’s favourite son, Bruce Lee, is the ‘little dragon’. They fly zephyr-like from mountain to sea through dragon gates that ensure good feng-shui, good fortune and fine wind-resistant architecture. Dragons are alive and well in Hong Kong. Nowhere is this truer than in Pokfulam Village, nestled in the west of the island amongst verdant hills. On a stiflingly hot September morning I approach Pokfulam. 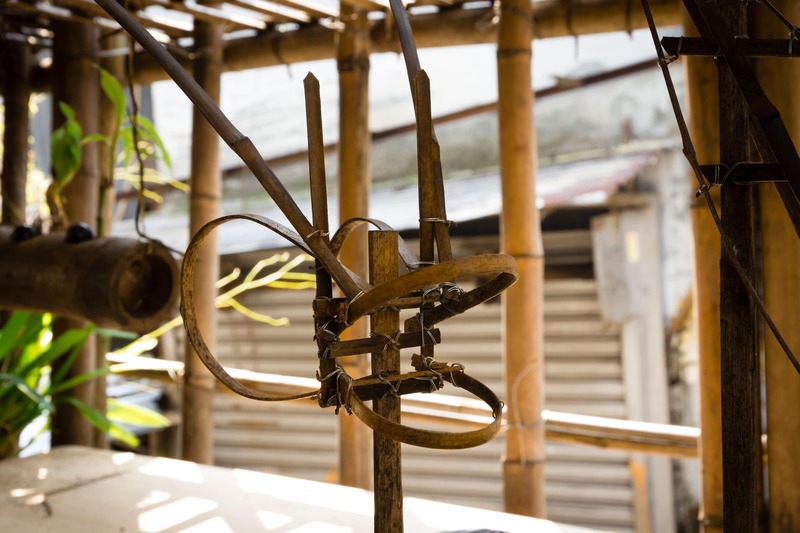 The village dates back to the 1670s when the Chan, Wong and Lo clans fled south to escape the Revolt of the Three Feudatories, an uprising against the Kangxi Emperor. At first glance the sprawling collection of corrugated tin roofs, clinging limpet-like to the side of Mount Kellett and High West, could be mistaken for a squatter settlement – a makeshift favela. The village entrance gives the impression of a castle’s ramparts and defending those ramparts – dragons. Rendered in bamboo and wire, they seem to roar at passing traffic. 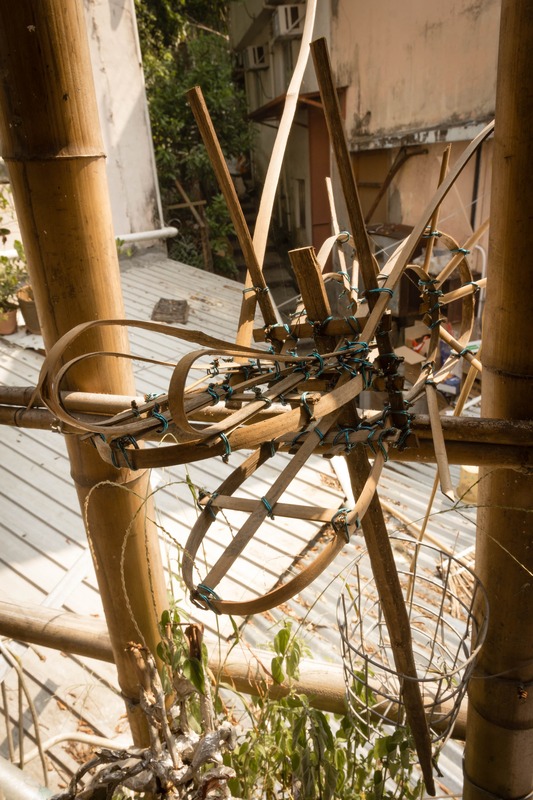 A bamboo structure bearing a large ‘welcome’ sign draws me in. As my eyes adjust to the relative gloom I realise the structure is full of miniature dragons. Some are just heads, their complex forms reduced to the simplest lines and captured in bamboo. Some snake intricately around potted plants and stout poles. I am here to find one dragon, in particular- the Pokfulam Fire Dragon. Some are just heads, their complex forms reduced to the simplest lines. 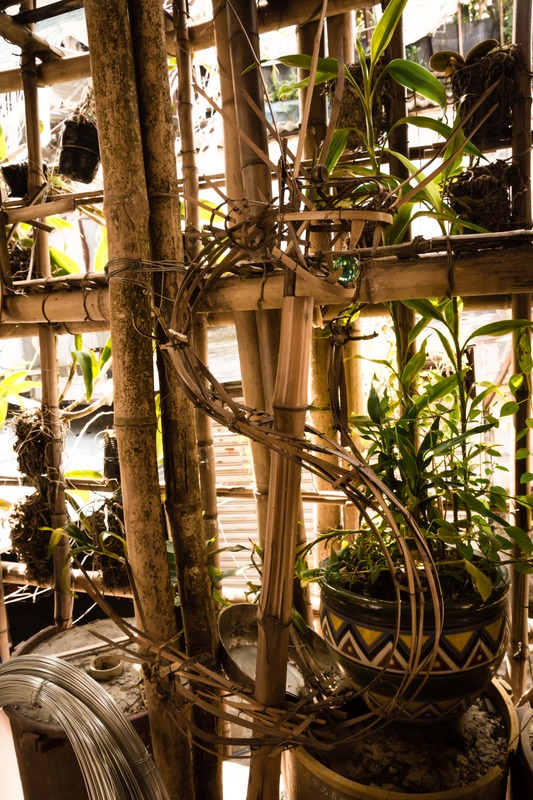 Some snake intricately around potted plants and stout poles. The Fire Dragon ritual has over 100 years of history and has its origins in a plague that ravaged the village, decimating its livestock. The villagers burned incense in the belief that fire would burn the plague away and, miraculously, it worked. Says Siu, ‘the people got together and decided that just carrying burning incense around wasn’t quite good enough, something was missing. 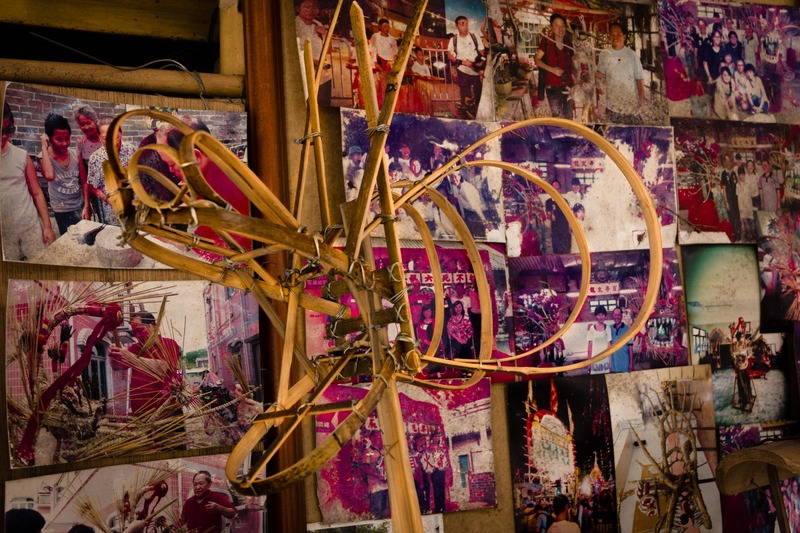 Dragons hold a revered place in Chinese culture, so slowly the people of Pokfulam Village began constructing a straw structure in the shape of a dragon, covered in burning incense. 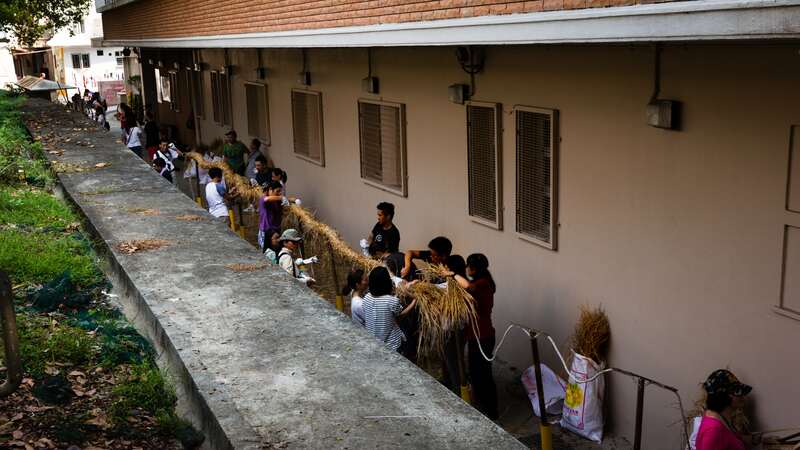 Slowly it became what it is today.’ ‘Why does it happen at Mid Autumn Festival?’ Siu asks, ‘Because at Mid Autumn Festival everybody comes home and can receive the dragon’s blessings’. 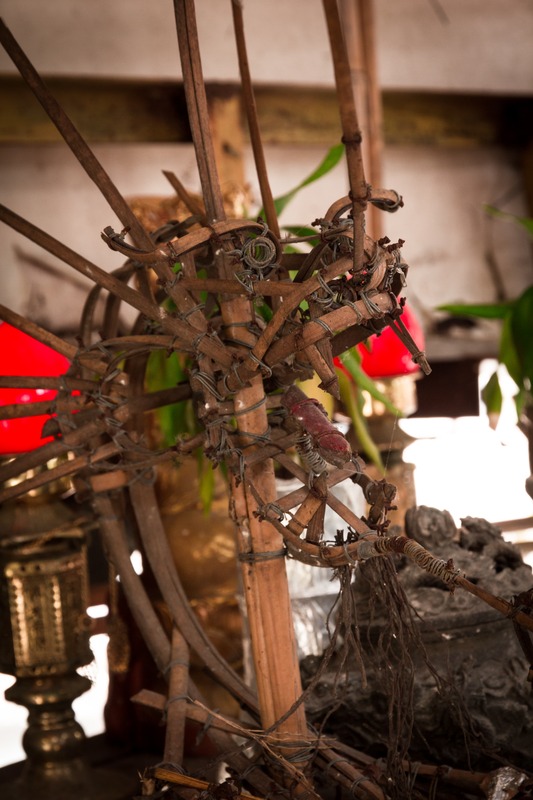 The ritual, possibly the oldest of its kind, has become a fundamental part of village life. 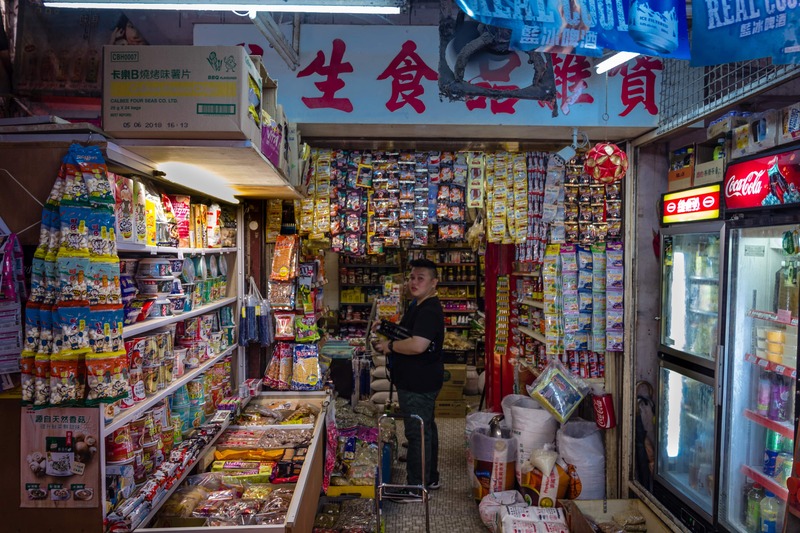 There is no connection to Tai Hang Village’s similar Fire Dragon ritual but ‘the desire is the same and the origins similar’. 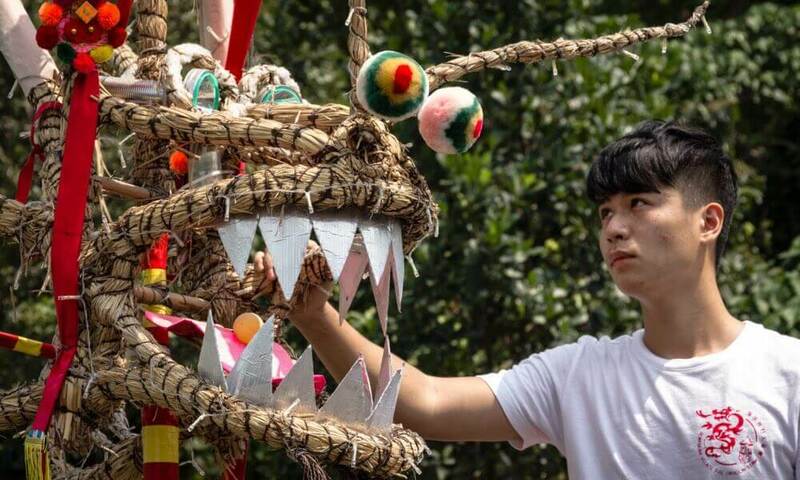 A Pokfulam youth works on the small dragon’s head. 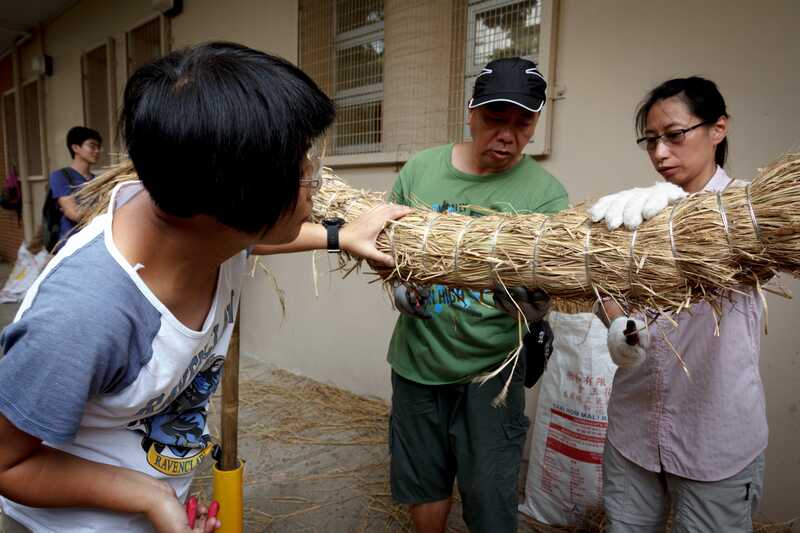 Members of a Sai Kung NGO help pack straw onto the dragon’s body. 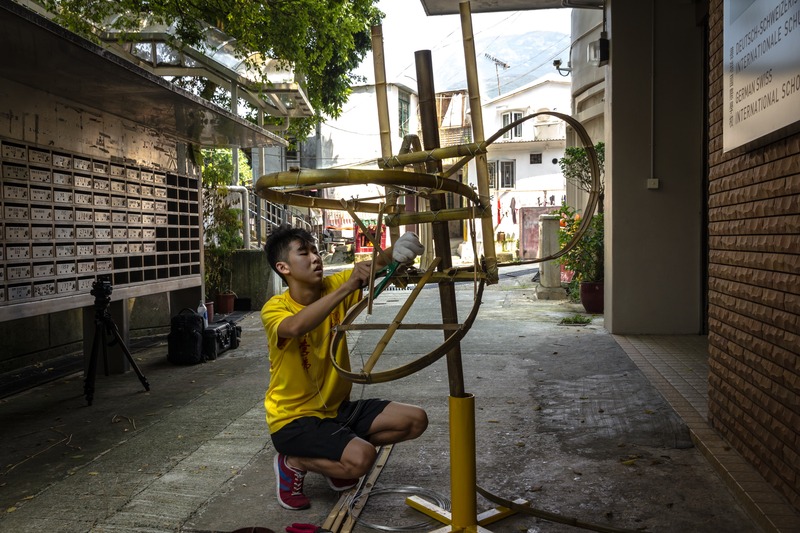 Ng Kong-kin, a master craftsman, is the village’s Fire Dragon sifu and oversees construction each year while his brother, Ng Kong-nan, trains the 30 or so participants including dancers, drummers and fire lookouts who guide the dragon through the village’s narrow streets under the full moon. Pokfulam’s older generation is ready to pass the torch onto their children. With just over two weeks till the big night, everything is in full swing. 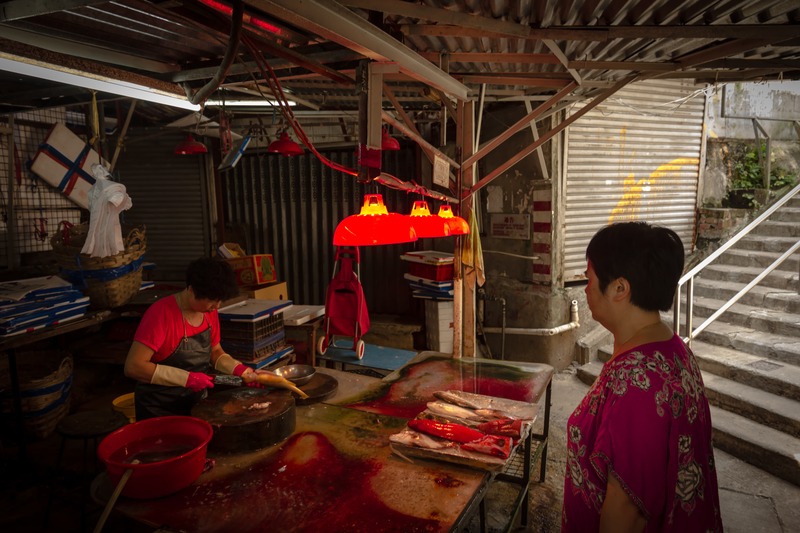 Siu leads us through labyrinthine passages lit with the glow of Red A market lamps. A workman repairs a traditional shop gate while a fishmonger displays the day’s catch. We emerge from the dark and follow narrow village paths flanked on both sides with stone buildings and mom and pop shops. We are led into a large two storey building with pink tiled floors, this is the Fire Dragon Team’s headquarters. 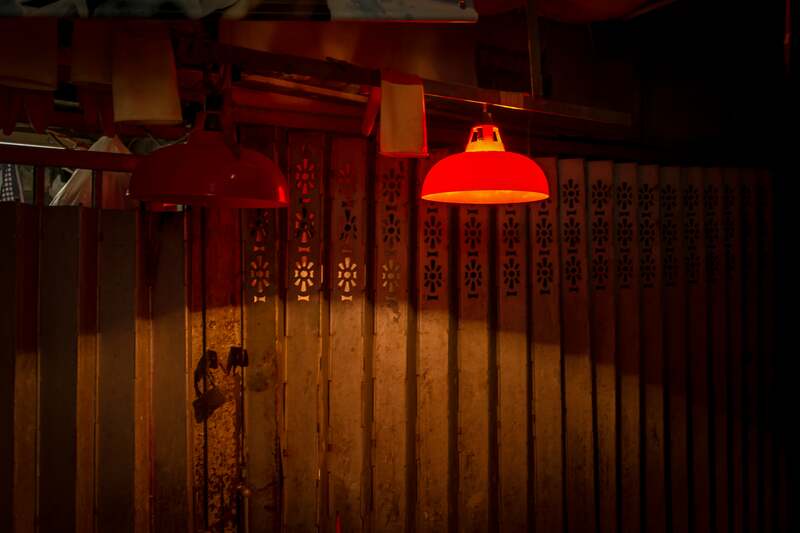 Labyrinthine passages lit with the glow of Red A market lamps. The right side of the room is piled high with bamboo dragons, flags, banners and other ceremonial paraphernalia. Siu entreats us to join him on the roof to enjoy a commanding view of the whole village. ‘On the big night we will start work at 6:30. We will light the incense at the bamboo structure by the village gate. At 6:45 special guests will arrive and they will paint the dragon’s eyes. At the bus stop we will parade the dragon and then we will give offerings at the Li Ling Divine Pagoda’. The two-storey miniature pagoda is another part of Pokfulam’s esoteric lore. 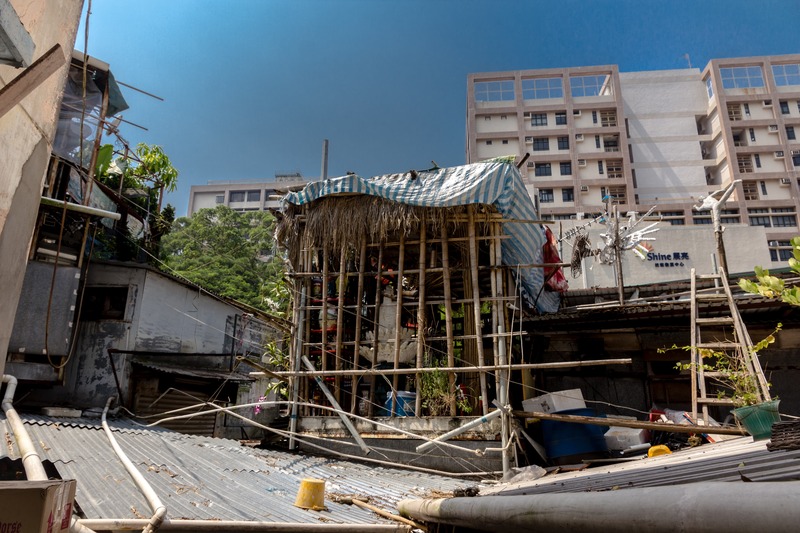 Thought to be the second oldest in Hong Kong, its origins are uncertain but oral tradition tells of the structure being an offering to a divine spirit who would protect the village from evil spirits. A fishmonger displays the day’s catch. ‘We will go the the Temple of the God of the Underworld to worship our main deity’ Siu continues. 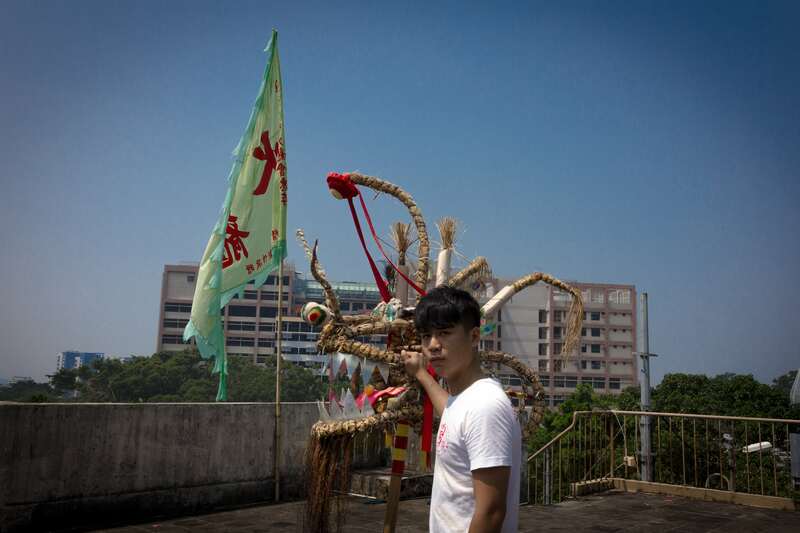 ‘After that we will replace the incense and the dragon will go into the village proper to bless each and every villager.’ Siu emphasizes that the Fire Dragon is not a performance but a ritual and the most important thing is to visit every single home. The roof of the Pokfulam Fire Dragon Team’s headquarters enjoys a commanding view of the whole village.